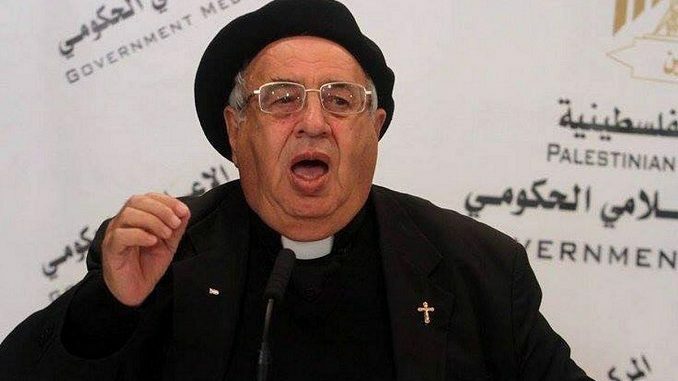 Senior Roman Catholic priest Monsignor Manuel Musallam has called for resistance against the Palestinian Authority and the Israeli authorities in occupied Palestine and abroad, Shehab.ps reported on Monday. He called specifically for acts of civil disobedience in the occupied West Bank. The veteran activist and member of the Islamic-Christian Committee to Protect Holy Sites told Shehab that the Palestinian resistance should establish an army and announce obligatory service across Palestine and in the diaspora. Protest tents, he added, should be erected in front of the office of PA President Mahmoud Abbas to “scream” in his face. Father Manuel Musallam of Jerusalem Patriarchate in besieged Gaza Strip, a relentless voice of Palestine from Gaza, is in advisory hospital as he fell today and broke his leg and underwent surgery that was successful! May Almighty help Father Musallam to get well soon! This, he suggested, could not be achieved peacefully, but through massive demonstrations and civil disobedience. Regarding Donald Trump’s so-called deal of the century, the Catholic priest said that it has been ongoing since 1948 when Palestine was occupied and includes the 1967 occupation of Jerusalem, Judaisation, and settlements as well as Israeli aggression. Asked about the Jewish Nation-State Law, Musallam said that this emanated from the infamous Balfour Declaration in 1917, which promised a national home for the Jewish people. Be the first to comment on "Senior Catholic Priest Calls for Civil Disobedience against PA (VIDEOS) #Palestine #GroupPalestine #israelTerrorists #boycottIsrael"